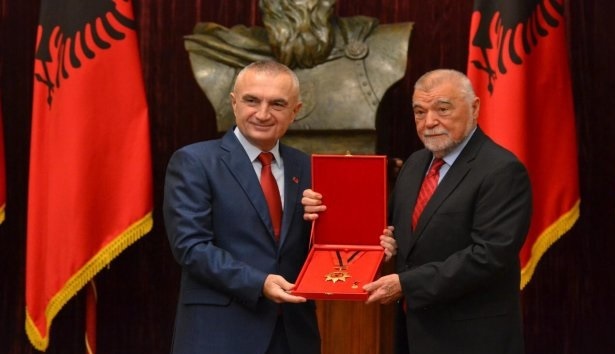 On the 106th anniversary of Albania's Independence, Albanian President Ilir Meta has decorated Croatia's former president, Stjepan Mesić with the "National Flag" award. According to Meta, this reverence comes from the ongoing efforts of former President Mesic to protect the interests of Albanians in the Balkans. During his speech, Meta stressed the fact that Mesic has protected the interests of Kosovo and its efforts for independence. "Today we remember all those friends who helped us realize our national ideals. So today we are all together, we are gathered to decorate President Stipe Mesic and express our gratitude for all he has done for the Albanian people. The president is an irreplaceable friend who has protected the rights of Albanians. The president is more than 50 years in support of Albanians. In the toughest moments of the Albanian nation, where the Milosevic regime trongly opposed Kosovo in a bloody. He was a strong voice against the massacres and ethnic cleansing, which accompanied this war. As the president of Croatia in his two mandates continued to defend the cause of Kosovo and its independence. He is an untiring advocate of protecting Albanian voices in Macedonia and in the Presevo Valley. His contribution has been very valuable, but today on the day of our National Flag I have the honor to decorate him with the National Flag award. Thank you once again Mr. President for everything you did for Albania,"said Meta. After receiving the award, Croatia's former president who has been in office for 10 consecutive years stressed that decoration is an appreciation for work and a strength to move forward in the same mission. He also talked about Milosevic's regime, who according to him fought for Greater Serbia, but in the end this initiative ended with zero centimeters gained and 100,000 killed. "Today I accept this decoration for what I have done, but also for what I have to do. As you know, I have been in Croatia for 10 years. I worked and cooperated with Albania and the rights of Albanians in the Balkans. As a president I am committed to the rights and injustices that have been made to them in Yugoslavia. Milosevic, who did not accept the federation and the confederation, was in charge of Serbia. He was the backer of Greater Serbia. Once upon a time Tito was with his charisma. Tito passed away. The second integrative factor was that the Communist party was destroyed. The third factor was the Yugoslav army. For Milosevic, neither the constitution nor the law mattered. Milosevic has been against any agreement, he has been the initiator of the wars and the expansion of the borders. Over 100,000 dead. He has not won a centimeter of borders. We now have an absurdity, many say that Milosevic has had good ideas but did not realized them. A wrong policy. This is similar to saying that Hitler has had good ideas in Germany, but he has not realized them. Relating to the EU. Great Britain has come out of the EU, it is actually in the process of partition. It is important that Europe joins together with the countries of Southeast Europe," Mesic said among other things.